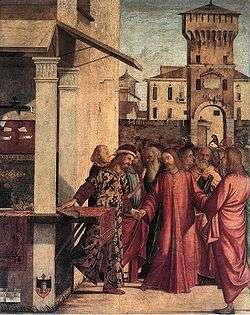 The Calling of St. Matthew, by Vittore Carpaccio, 1502. The Calling of Matthew is an episode in the life of Jesus that appears in all three Synoptic Gospels, Matthew 9:9-13, Mark 2:13-17 and Luke 5:27-28 and relates the initial encounter between Jesus and St. Matthew. In all three synoptic gospels, this episode takes place shortly after the miracle of Healing the paralytic at Capernaum and is followed by New Wine into Old Wineskins. In the Gospels of Mark and Luke the person called is called Levi and the son of Alpheus. "Why do you eat and drink with tax collectors and 'sinners'?" Jesus answered them, "It is not the healthy who need a doctor, but the sick. I have not come to call the righteous, but sinners to repentance." Wikimedia Commons has media related to Calling of Saint Matthew.